ENGIE Brasil is organizing the 5th edition of the ENGIE Brasil Innovation Award and is looking for innovative solutions related to Health and Safety at Work. To consult the Portuguese version click here. Services performed with electric risks (low or high-voltage). Safety at Work:: Solutions that aim to reduce labor accidents and which guarantee the safety of employees in the workplace. Ocupational Health: Solutions that aim at reducing diseases related to labor activities and which improve the health and performance of employees. Warning: Files submitted for the ENGIE Brazil Innovation Award 2019 must be in Portuguese, even if the application form is in English. Ticket to Paris and accommodation for the project manager (specified in the application) + team member, to participate in the Group international innovation event, the ENGIE Innovation Week, which will take place from June 17th to June 21st 2019. Pitch the winning solution during the ENGIE Brazil Innovation Day 2019, which will take place in Rio de Janeiro, on June 6th, in the Museum of Tomorrow. The event will be open to the public and will count with the participation of authorities, entities and companies in a debate panel on how innovation can contribute for Health and Safety at work. Test and evaluation of the project aiming a partnership with ENGIE to implement the project in Brazil, based on the proponent interest and the project’s applicability. Solutions should be based or deployable in Brazil. The documents and information submitted must be in Portuguese even if the application form is in English. Evaluation criteria are applied to projects using a scale that ranges from 0 (minimum) to 4 (maximum). For more details on the evaluation procedure see the attached file on the bottom of the page. 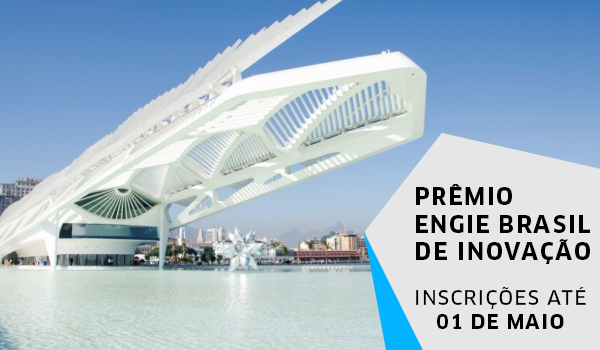 The winners will be awarded during the ENGIE Brazil Innovation Day 2019, which will take place on June 6th, at 8h30 am at the Museum of Tomorrow, in Rio de Janeiro. The winning project will be posted on the website https://innovation.engie.com. It is thus essential that the project managers stipulate the level of confidentiality of their projects. Language: Files submitted for the ENGIE Brazil Innovation Award 2019 must be in Portuguese, even if the application form is in English. A summary containing 5 items: title and background (300 words), description of the problem to be solved (300 words), key innovative aspect of the project (40 words), description of the innovation (300 words), recorded results (300 words), implementation/feasibility (300 words), description of the team (40 words). One illustration of the project must be attached. It must not exceed 1 MB. Videos can be sent attached to the file through a link to a website. Uploads of short films will be allowed if attached to the registration form. Every project will be handled in complete confidentiality by those persons authorised to have visibility of their content, i.e. the members of the Jury. Only the Jury will have access to information relating to data indicated as confidential. The communication between the Project team and the organizers of the ENGIE Brazil Innovation Award 2019 will be restricted to the Project manager specified in the application. The submission of a file for the ENGIE Brazil Innovation Award 2019 implies acceptance of these rules. Evaluation criteria are applied to projects using a scale that ranges from 0 (minimum) to 4 (maximum). Please refer to the additional explanation in the table below. 0 = No innovation. Already in the standards and common practice of companies. 2 = Significant improvement of an existing solution.